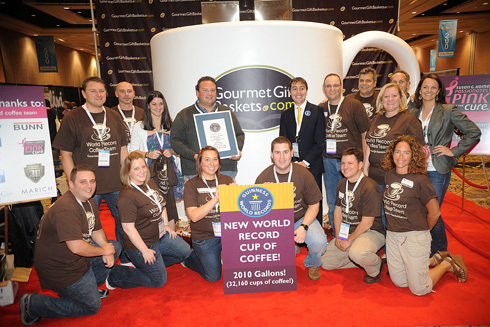 GourmetGiftBaskets.com doubles previous record with a cup of java holding 2,010 gallons! Companies that aided in the breaking of these records include: Terracon Corporation of Boston supplied the storage tank that is the foundation of the cup, Chisel Productions Inc. of Georgia is constructed a coffee cup and handle around the tank using a sculpted foam with a hard polyurethane finish, Kerry/ X Cafe of Princeton, MA provided the 100 percent Columbian Arabica blend coffee, Logo Loc LTD of New Hampshire provided quality custom t-shirts, Marich Confectionary of California donated samples of their Chocolate Covered Espresso Beans and Bunn-O-Matic Corporation of Springfield, IL supplied the high volume coffee dispensers designed to meet the requirements of the world record attempt. Blog World Expo, the world's largest blogging social media conference in Las Vegas at the Mandalay Bay Convention Center, South Pacific Ballroom; Booth #335. Americans consume 400 million cups of coffee per day, or equivalent to 146 Billion cups of coffee per year; making the United States the leading consumer of coffee in the world. Abood saw this statistic and knew a record involving coffee was one to break. This world record attempt will require two 60 Amp 208 Volt Three Phase power supplies, two directly plumbed water lines providing 3 gallons per minute and the equivalent of 89,305 times the amount of coffee needed to brew your standard 8oz cup of coffee. The Motto is 2,010 in 2010! GourmetGiftBaskets.com will break the Guinness World Record for the World’s Largest Cup of Coffee when 2,010 gallons of fresh coffee will be brewed into a 8x8 foot specially constructed coffee mug, breaking the current world record of 911.5 gallons set in 2007. GourmetGiftBaskets.com has been making unique, upscale, gourmet gift baskets for the discerning consumer since 2002. 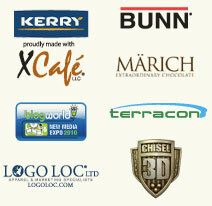 Since then, they’ve been working to introduce their customers to the finest gourmet foods on the market. They take their work seriously; they source from over 600 different gourmet food suppliers to bring customers only the finest gourmet foods in beautiful, reusable baskets. Whether an anniversary, birthday, holiday, or the closing of a major business deal, GourmetGiftBaskets.com takes pride in knowing that their customers send Gourmet Gift Baskets to highlight some of the most important events in their lives. For more information, visit www.gourmetgiftbaskets.com or call (866) 842-1050. Nancy G. Brinker promised her dying sister, Susan G. Komen, she would do everything in her power to end breast cancer forever. In 1982, that promise became Susan G. Komen for the Cure, which is now the world’s largest breast cancer organization and the largest source of nonprofit funds dedicated to the fight against breast cancer with more than $1.3 billion invested to date. For more information about Susan G. Komen for the Cure, breast health or breast cancer, visit www.komen.org or call 1-877 GO KOMEN.lent to 32,160 cups of fresh brewed coffee.